In the days when folklore and legend were a very real part of every day life for the ordinary common folk, spirits were thought to be everywhere. 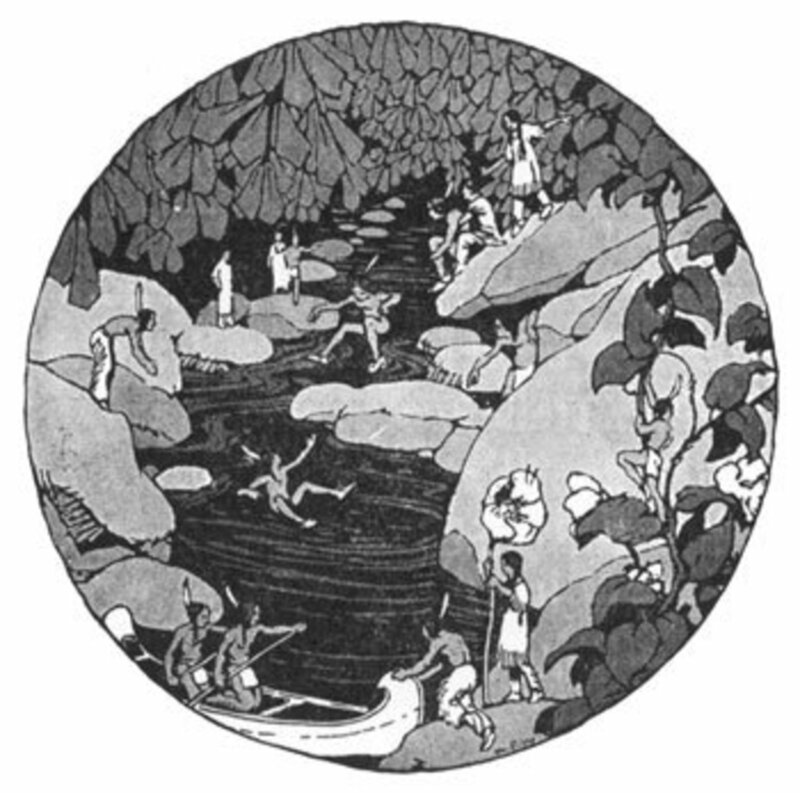 From household spirits, to land, forest, and water spirits, they were a very real part of the daily lives of our ancestors. A great canon of lore built up around these "wee folk" (who were often not actually very little!). Mythologists have tended to study the pantheons of great gods and goddesses who's adventures were chronicled in epic legends. But, the average person interacted with the smaller, more local spirits who surrounded their home, land, and the wilds. Lore surrounding these Wee Folk also survived as living folklore for centuries after conversion to Christianity, when mythologies of the large scale deities were stamped out. These "small" spirits (small in comparison to the great deities of myth) represent remnants of the Old Religion that carried on at local level for many hundreds of years. The existence of supernatural fairy-like beings was believed by virtually everyone across the social strata until the birth of Science during the Age of Enlightenment. 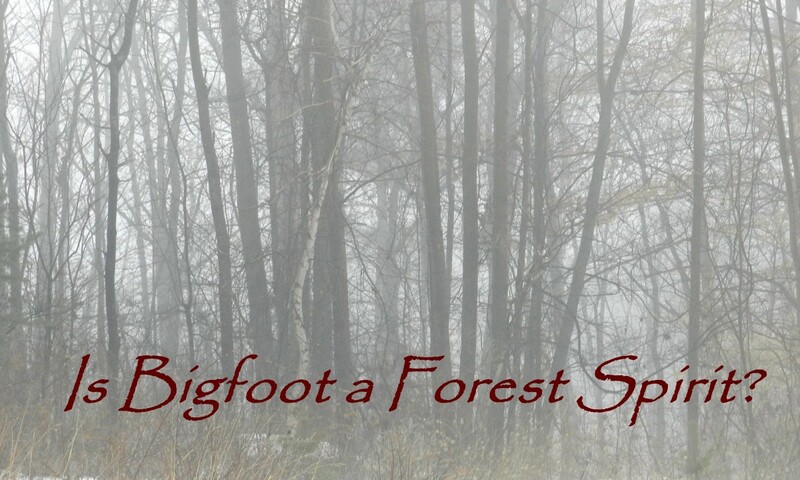 The forest was home to many different types of forest spirits, and here we will explore just a few of them. 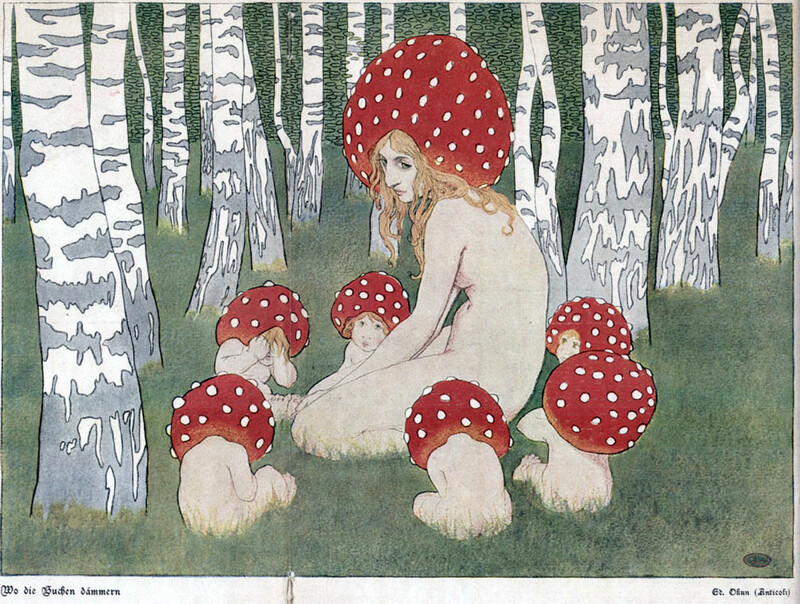 A mushroom mother and her children. Art by Polish Art Nouveau artist Edward Okuń. 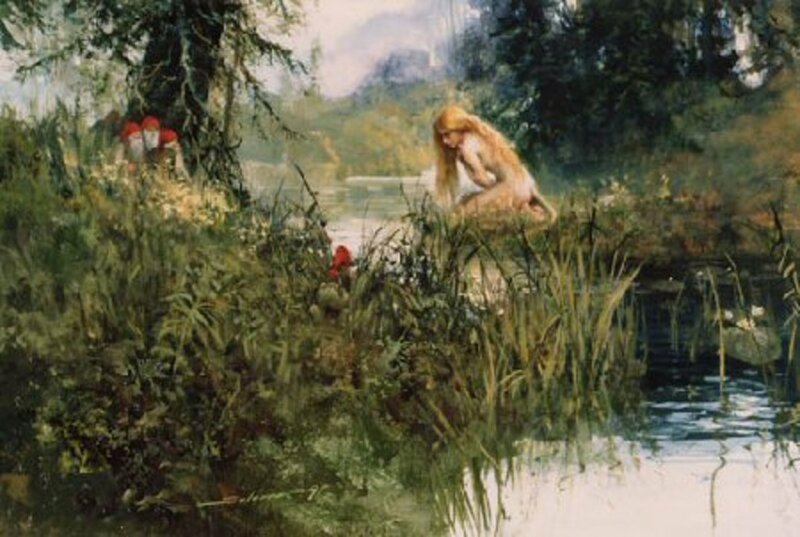 From the early Middle Ages up into the early 20th century, for many folk living in the rural countrysides of Europe the wild aspect of nature was still untamed. Dangers lurked in the woods and waters. It was believed that spirits jealously guarded their territory and might punish trespassers. On the other hand, spirits could be helpful. When treated with respect, a human might be blessed or rewarded by befriending certain spirits. However, because spirits were capable of both good and bad tempers, the wise approach was to use caution when confronted with one. This was really an extension of the dangers posed by the forests in general. Woodlands provided sustenance, building materials, and medicinal plants. But, they also were home to fierce predators that once stalked the woods of Europe. Among the the most fearsome creatures were wolves, bears, and wild boar. One had to keep their wits about them when walking through the wood, because sneaky eyes could be watching at any time. Fear of the unknown influenced people's folk beliefs, and sometimes spiritual answers were the best solution to misunderstood occurrences. Getting lost, for example, on a path that a traveler has traversed many times over and knows well could be the work of a mischievous fairy. Becoming sidetracked to follow a trail unnoticed before could be the work of some unknown entity trying to lure an unsuspecting traveler into another realm. 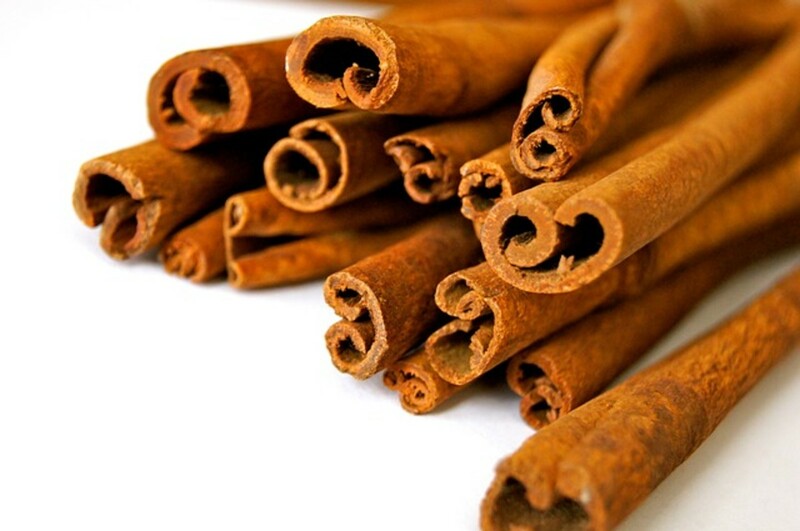 Foraging for food may, in some cases, cause people to ingest psychoactive plants. There are many wild plants with entheogenic properties which can alter perception or even cause hallucinations. Even without this influence, a weary traveler may see something strange through the mist and since it doesn't fit within his lexicon of understanding, he attributes it to something supernatural in nature. Whatever the actual causes may have been, these beings were very real to the people who saw them. Do you believe in woodland spirits? The Huldra is a mysterious creature. She is among those feminine spirits who seem to embody the wildness of nature to lure men astray. Mermaids and sirens come to mind, as representatives of the wild women of the water. 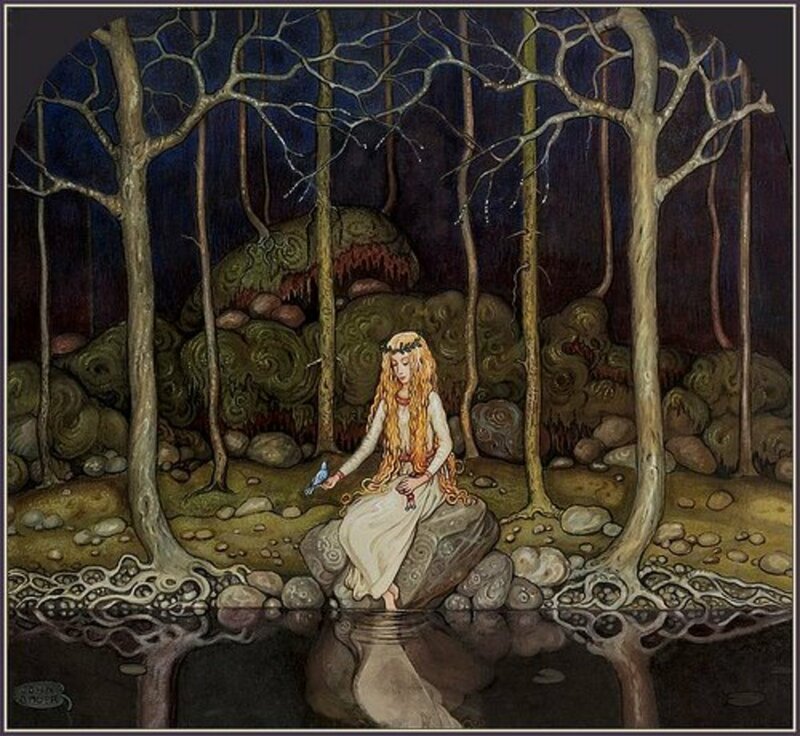 The Huldra performs a similar role in folklore of the forests of Scandinavia. Like her watery sisters, the Huldra is said to be exquisitely enchanting. Although men are warned of the dangers she represents, they are still allured by her beauty. She may appear as any other ordinary woman, but for two tells. The Huldra's main defining feature is her long tail, similar to a cow's tail. She takes great measures to hide her tail, so that men will not be distracted from her seduction. The other give away is that if the Huldra is approached from behind, her body appears hollow! 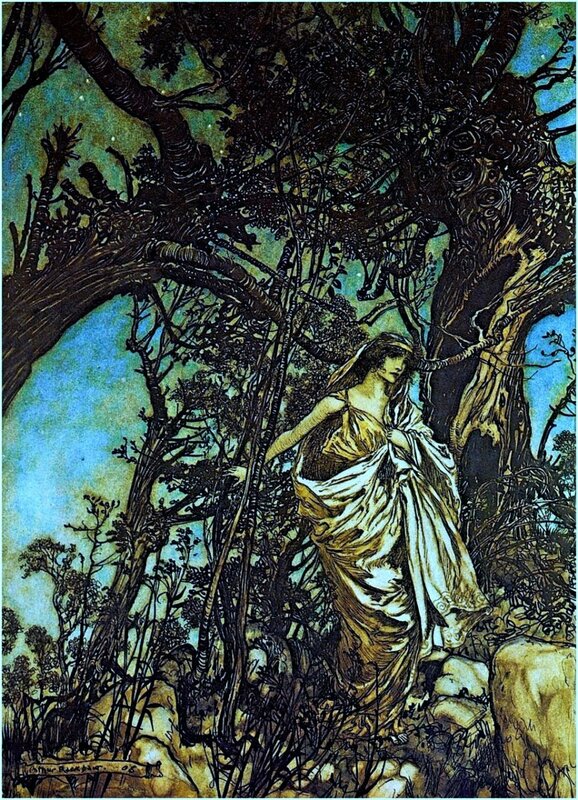 There may be a connection between the Huldra and the German goddess Frau Holle. Holle is known by many names in different German speaking areas, and one of her monikers is "Holda," which is thought to be etymologically related to Huldra. 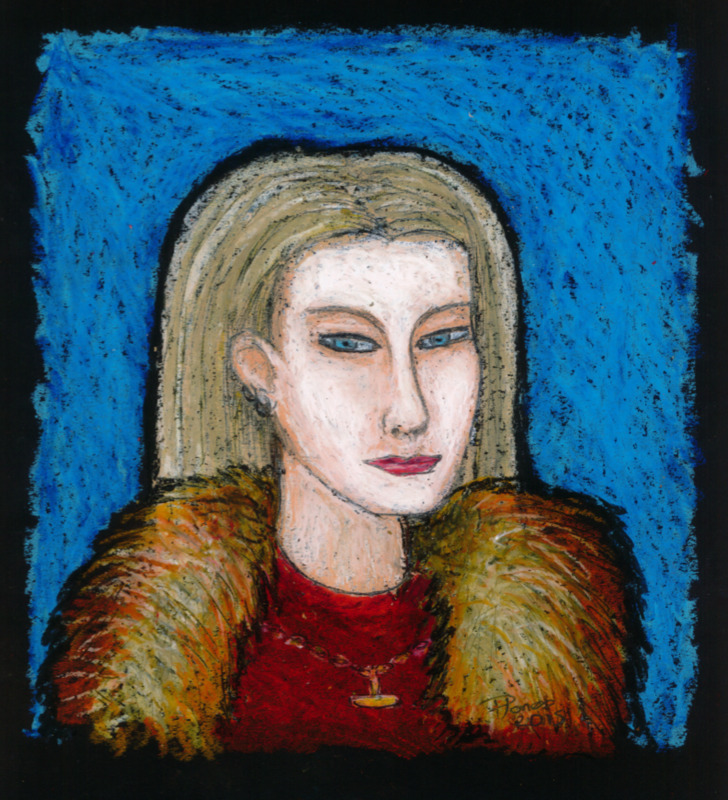 One similarity between Holle and the Huldra is that while both may appear as young and beautiful women, they may also appear as haggard old crones. Another similarity is their connection to the forest. 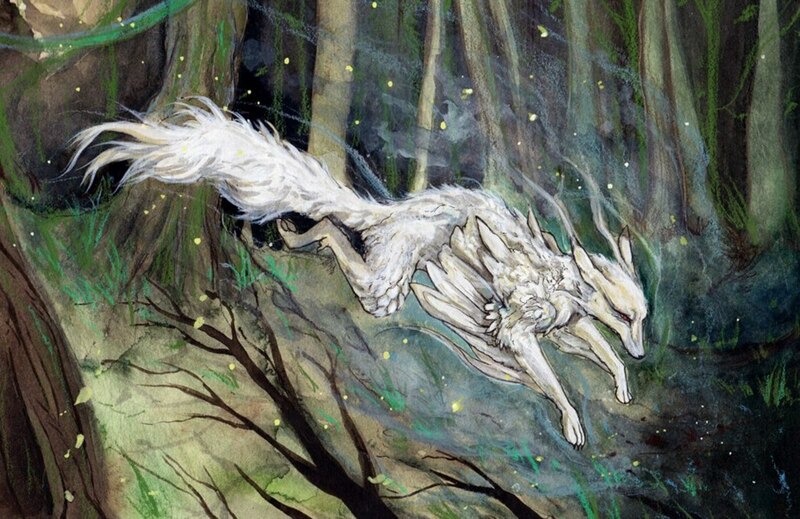 While Huldra is a forest spirit, Holle was once known as a protectress of the forest, and of wild animals. In Iceland, the word for elves is Huldufólk. This literally means "hidden people," but it is thought that there may be a connection to Holle/Holda/Huldra. 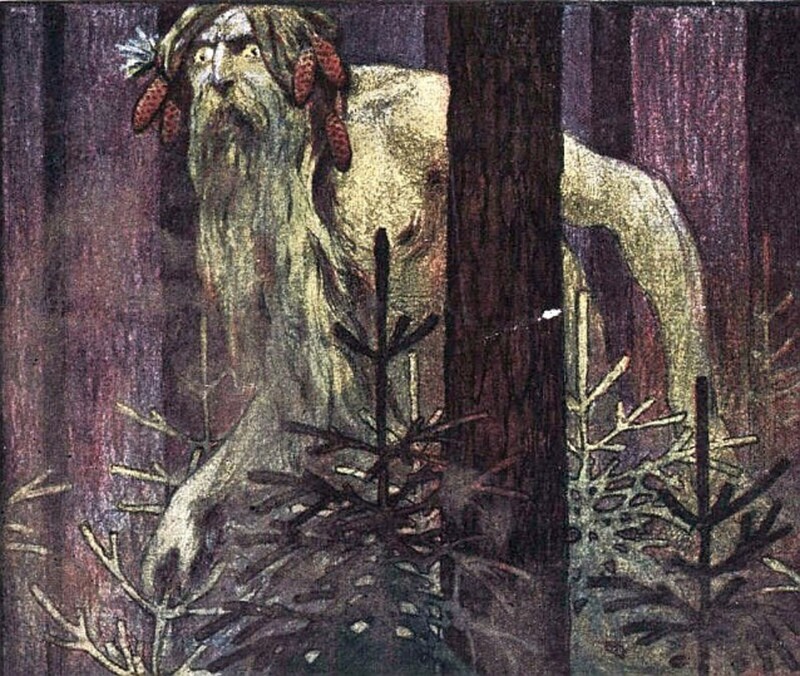 The Leshy is a forest guardian spirit from Russian and neighboring Slavic regions, where he is known by such similar sounding names as Lesovik, Leshak, etc. He may have a similar origin as the British Green man, but is also in the vein of the wodewose (wild man) archetype. As protector of the woods, Leshy is the lord of all the animals in the forest. If entering the woods to take necessities from it, such as firewood or game, it was customary to leave an offering of salt, bread, or milk. Accounts of Leshy's appearance vary somewhat. Some say that he has a pale greenish skin, others say that his skin is blue or grey toned. But, he is always described with wild green hair and a beard. It is also often said that he wears his shoes on the wrong feet, and he casts no shadow. The Leshy is a shape-shifter and he can miraculously appear as a mortal man to confuse and mislead trespassers in his glen. Travelers are warned to stay close to the path for the Leshy may seek vengeance by leading them deeper and deeper into the wood only to abandon them and disappear laughing! He could also change his size to be as tall as the tallest tree or as tiny as a blade of grass. Though he is connected to all wild animals in his forest, bears were the beasts most associated with Leshy. This may be partly due to their fearsome strength, but also because they hibernate in the winter. The Leshy and his kin fall into slumber when the leaves fall off the trees in autumn and do not reawaken until the new leaves bud in spring. The turbulent weather seen in springtime was said to be the Leshies expressing their rage at having been suppressed throughout the winter. Very bad storms happened when two or more Leshies quarreled with one another. Although the Leshy was a fearsome creature, he was not so harsh that he did not have a sweetheart. In fact, the Leshy was married to a Lesovikha and together they had children, the Leshonki. The Moss Folk come to us from the forests of Germany where they are known as Moosleute or wilde Leute (wild people), but they can be found in the folklore of the neighboring central European countries of Poland and the Czech Republic as well. They sometimes are known by other names such as Forest Folk or Wood Folk. Most of the Moss Folk are female, so they are also referred to as Wood Wives. No matter what they are called, these creatures are always highly identified with trees and considered to be the trees' guardian spirits. In appearance, the Moss People are typically short in stature and appear elderly; but this does not imply frailty, rather an image of aged wisdom. Moss covers their face, their hair is like grey lichen hanging from their heads, and their limbs are like knotted Maple bark. These Wood Women also weave moss to dress the roots of the Maple trees. Unlike the Leshy, the Moss Folk are generally helpful to humans so long as their forests are respected. 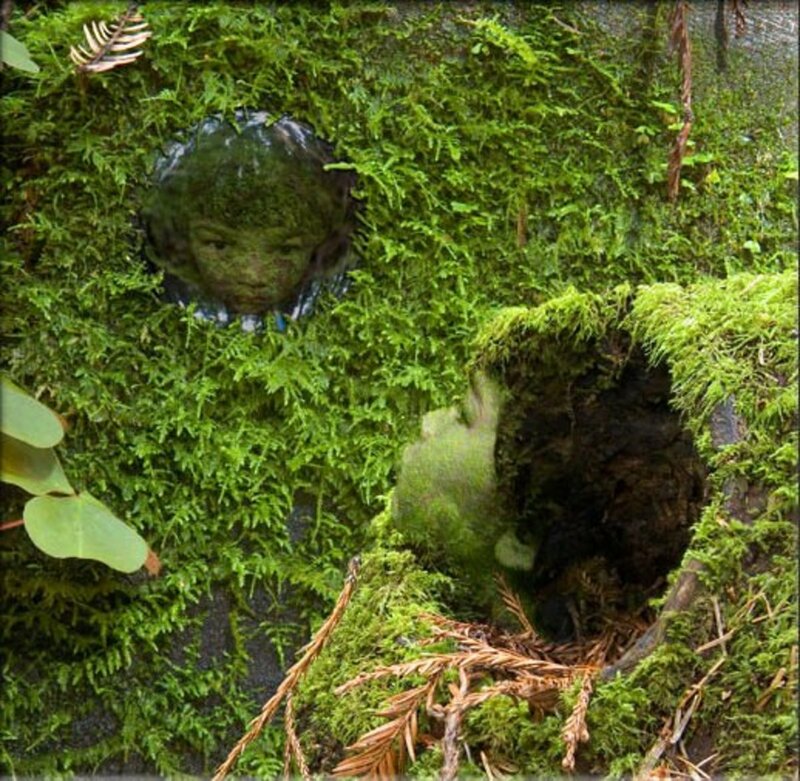 Befriending a Moss Woman may result in her sharing the secrets of her forest, such as which plants to use for healing. If one of their saplings is carelessly crushed underfoot, however, they will chase the offender out of the forest! And over the fields in terror they fly. Is the hair that over her mantle flows. 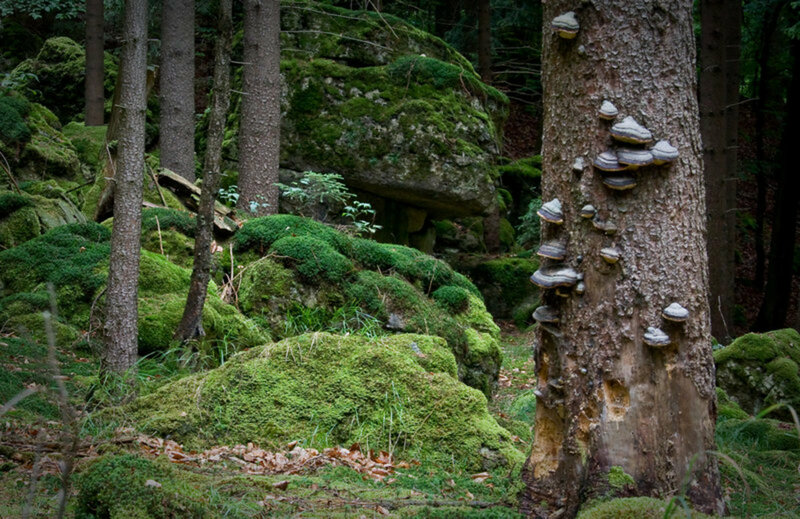 As stated above, Moss People (women) are sometimes referred to as Wood Wives. But there is apparently an alternate version of this being. Sometimes the Wood Wife appears young and beautiful. So, here we see another creature who possesses traits similar with the Huldra and Frau Holle, both of whom might appear as a young seductress or a withered crone. In this youthful incarnation, the Wood Wives may also be referred to as Moss Maidens. Another association between this creature and Frau Holle is her association with the Wild Hunt. In Germanic and Celtic mythology, the Wild Hunt would occur during Yuletide. Sometimes called "The Furious Host," it was led by Odin on his eight-legged horse, Sleipnir. 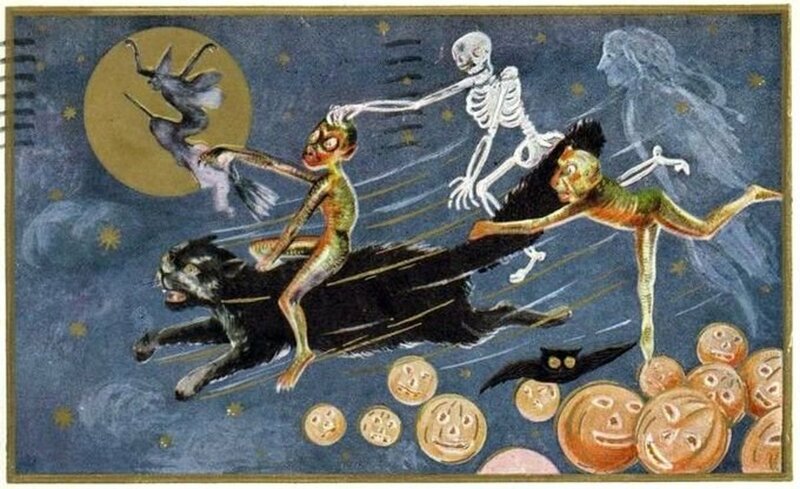 This fantastical event was both fabulous and frightening as a large host of wild spirits were thought to fly through the night sky. In parts of Germany, Frau Holle was believed to ride with Odin. In some regions, it was said that Holle lead the Wild Hunt herself. Wood Wives and Moss Maidens are found in folklore surrounding the Wild Hunt, however they are not to be found participating voluntarily. Rather, it is said that the "Wild Huntsman" chased these poor beings as they scrambled for their lives. Trees marked with a cross offered a safe haven where the Wood Wives could scurry inside and ride out the storm. The Huntsman could not reach the little Moss Maidens when they were safely tucked away inside. 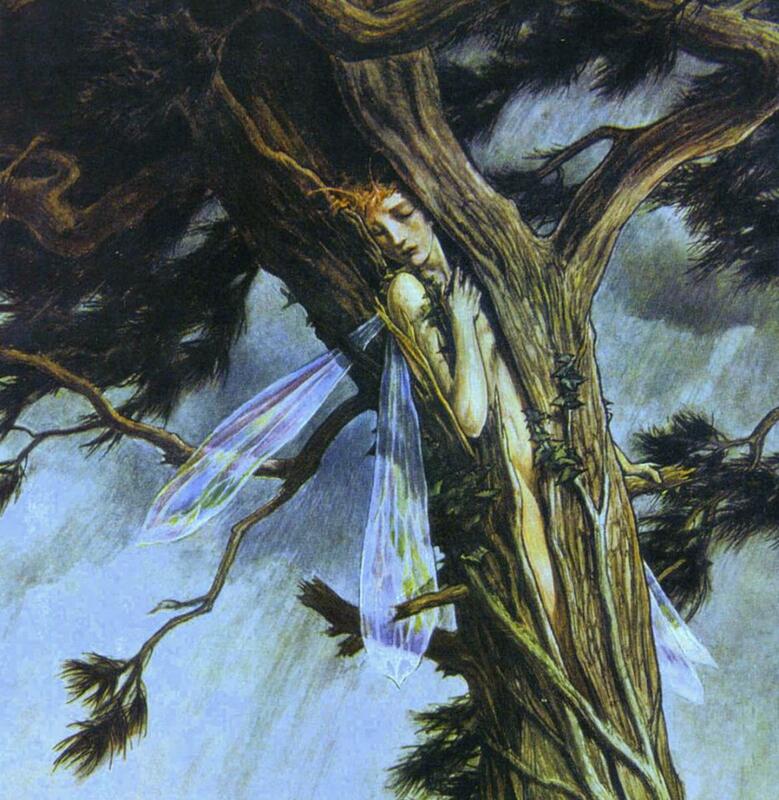 Because these creatures were so beloved by the humans who frequented their forests, woodsmen were known to leave a sizable stump remaining after chopping down a tree, and then mark it by carving a cross into the stump so that these fair woodland maidens had a safe place to hide. 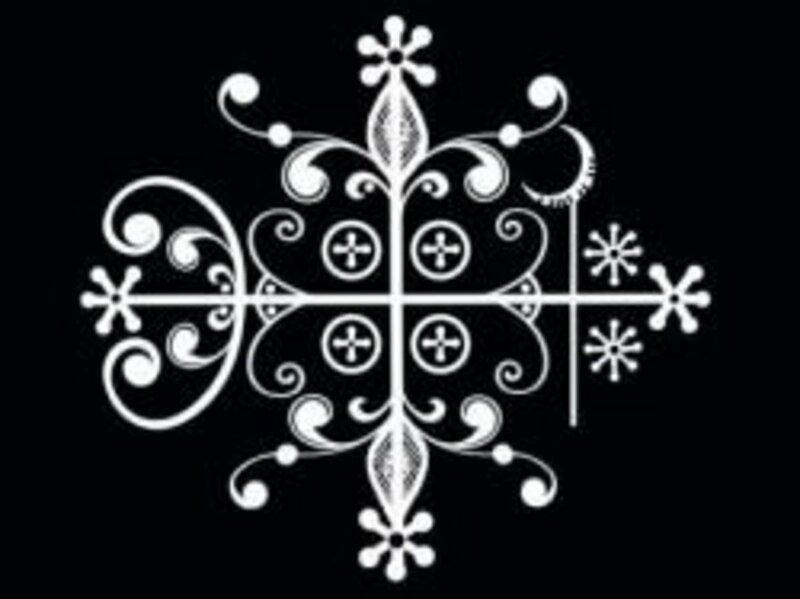 In much of later folklore, the cross was said to be reviled by mythical beings. This is likely due to the efforts of Church leaders to break old pagan customs still clung to by people in the rural areas. Many stories are told where various forms of "wee folk" are driven off by the cross. It seems telling that these Moss Maidens were so loved that while the cross could ward off the powerful and fearsome Wild Huntsman, it was a protective amulet for the Moss Maidens. Did you learn something new about mythological creatures? Yes, I had never heard of ANY of these creatures before! Yes, I had heard of some but not all of these creatures. No, none of these creatures were new to me. So lovely articles like this help to calm me. This subject matter has fascinated me my whole life & I will be 67 in 5 days! My mother growing up in Czechoslovakia lived along a river in a small town outside of Prague. She was told that if went to close to the edge of the river she might be snatched by " Water man ". Toghether my mother and I traveled through Prague and spotted an artisian who carved beautiful puppets. My mother spotted " Waterman " ! we bought it and to this day it is hanging on our fire place mantle. A very nice read. The Huldra sounds like an inspiration for La Belle Dame sans Merci. A very nice hub, Carolyn! I like reading about the old thoughts that people had years ago. Voted up! Very interesting hub! I don't know your work, but the article is engaging and well written! I really enjoy the old myths and legends, and like to think that at some of them might be true. I learned a few new things. I wonder if the Leshy might be akin to another lore—the Sasquatch? Nice work! This was very interesting. I live in the forest in the Eastern US. I have never heard of these creatures, but I have seen my own creatures in the forest that I live. Voted up! A really lovely article! I enjoyed this. Thank you! Thank you, Carolyn; I thoroughly enjoyed reading you excellent article. I especially enjoyed the account of the Leshy. I've never heard of these forest folk and will watch and listen for them when I walk in the woods next time (as well as being on the look out for snakes). Voted up and more, and pinning. This is very interesting, Carolyn. I had never heard of these beings before I read your hub. It's so enjoyable to read about nature spirits and their roles in the lives of earlier people. This was interesting to read. You forgot one big guy though, Big Foot. That is the creature everyone claims to have seen around here.